Crowdfunding – a really good idea which has given birth to so many really good products that may have never seen the light of day (read: commercialization) if not for the crowd of supporters. Hence, the blogger supports projects every once in a while, too; especially those close to her biker’s heart. Such as the really nice coffee table book by We Are Traffic which took an awful long time through actual production. But the long wait was worthwhile – every single page of that book was worth the support. 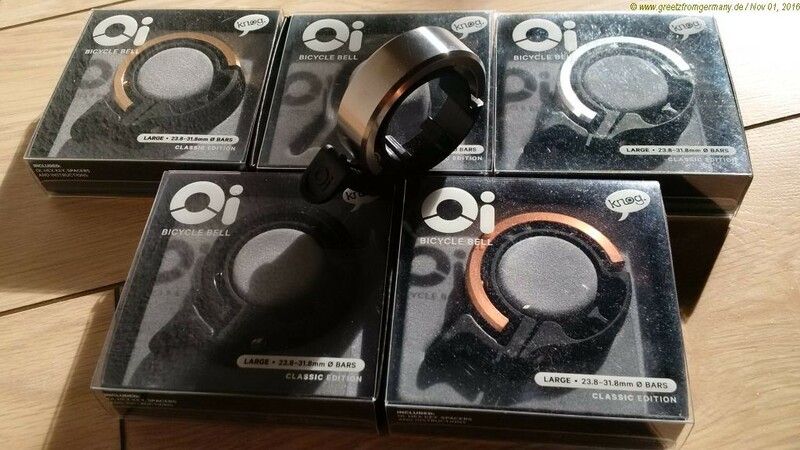 Oi – The bike bell that doesn’t look like a bell by Knog seemed like another one of those projects that was a „win-win“ for backer and entrepreneurs alike. And since the blogger’s positive sentiments for DownUnder, which evolved lately, surely added to wanting to support the Knog guys. Off went a pledge for five bells, one of each of the different metals used, plus an extra AUSD 10.00 in order to cover the shipment costs. All good. A pretty long and pleasant stream of interim notes and update emails later, the shipping details were sent. Surprising enough, shipment was done through the US, but what the heck. But as soon as the shipment touched German ground, the Odyssee only began. Because the US Knog guys apparently had not attached any documentation to the outside of the package. So the parcel was parked in German customs, a 1-drive of at least 45min from its destination at the blogger’s office. Customs grants you 7 days from notification to get any shipment out by yourself. Only that this notification was marked a Thursday, made it to the blogger’s letter box on Friday, with customs being closed on Saturday and Sunday – and the blogger being fully booked by her bread and butter job on the remaining three weekdays. Good that German Postal Services has this service of resolving such situations on the recipient’s behalf. You have to shell out a full € 28.50 for this service though, independent of the value of the respective shipment. 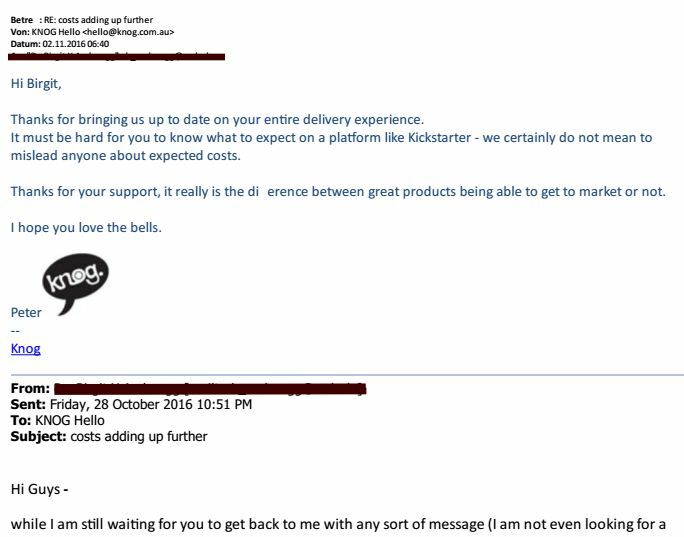 Since Knog had and kept their head in the sand, playing dead to all emails about this topic, coming from the blogger as well as from the Crowdfunding platform support guys, German Postal Services was finally asked to get the shipment out. Which they did – and delivered in exchange for another € 20.12, which was 19% tax of … well, not the value of the bells, neither the amount pledged (not even the amount PLUS shipment costs payed in advance) – but bad came to worse, and the postal guys added another AUSD 10.00 to the value they used as basis for their tax calculation. 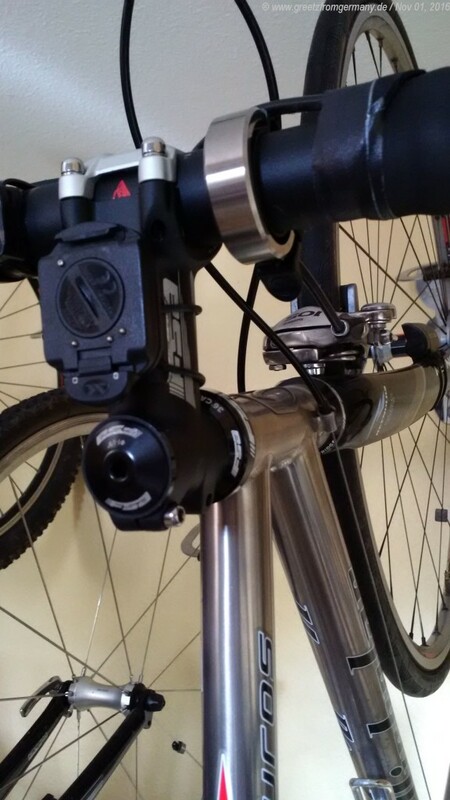 The titanium Oi has, meanwhile, been mounted to the titanium bike – although it may take a while before the irritation about Knog’s behavior and reaction (or rather: lack thereof) will be forgotten. All in all, these five bells are very nice. And shall be held in high esteem. Not only, but also for the reason that the money postal services and tax added to the actual pledge have added another 50+% to the actual pledge sum. It will be written off as … well, not even for a good cause, as this additional money does not go to the entrepreneurs of Knog. Recommendation to readers: Nice bells that certainly can be recommended as a product. But go and buy them from your trusted bike shop which will sell them for about € 20 + some € 3.95 shipment costs (if bought online). That’s not only a way better deal for the money, but also no further running around, filling out forms and discussing with customs over the phone will be required at your end. 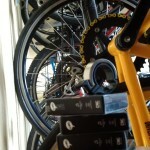 Hello Birgit, i, too, have made some experience with crowdfunding (as a „funder“) I backed the Obree Movie, a bicycle-related art piece, and other stuff. I see it as a way of helping creative people do something nice, and/or help an ingenious piece of niche product reach the market, which otherwise possibly wouldn’t happen. Furthermore: Thanks for backing the Obree Movie! Thanks for sharing the general feel wrt Crowd Funding.